Ryan Ellett has a new book out through McFarland Publishing. For radio buffs like myself, this is a welcome addition to my bookshelf. My concern is whether or not this 230-page reference guide will be accepted with arms wide open from the general collector. 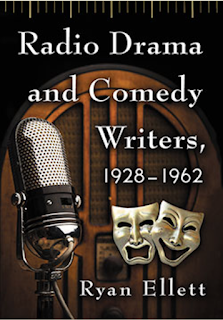 As Ryan explained in his Preface, "In a literature that includes hundreds of books and even more articles penned by professional historians and devoted amateur enthusiasts, the writers of those old-time radio programs lack a resource with a singular focus on their output. This book attempts to remedy that oversight..."
What Ryan is referring to is the consultation of published reference guides as they lend themselves to assistance in research. In my field, for example, my custom-built bookshelves contains two shelves of "essentials" -- that is, books I consult so often that I group them together for easy access. Some of the paperbacks were made into hardcovers thanks to my local printer (or replaced with the hardcover editions when they became available). Then there are the second tier reference guides -- books I pull off the shelf to consult the indexes and determine if any of them have something I might be looking for. Nothing in the index? Back on the shelf they go. The third tier books are ones I have rarely consulted but maintain possession in the event I need to turn to them. The price was right at the time and I could not turn them down. Some are so old and loaded with so many mistakes that the only reason I keep them is to consult once in a blue moon on the off chance I can use them to track down the source of errors. Ryan's book falls into the second tier level and this is not to say his book is bad. On the contrary, within minutes of flipping through the pages I knew this was an essential second-tier book because of the wealth of material contained in alphabetical order. Like all the other books on my shelf, almost every radio program I research in the future will require a quick consultation of what has been put to print and Ryan can be sure I will be pulling this one off the shelf many times. 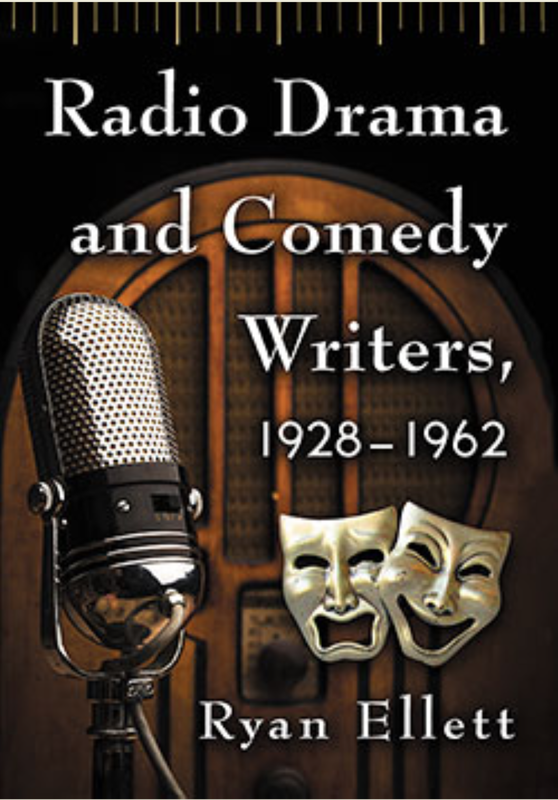 Essentially this book lists radio script writers and brief biographies, along with extant radio credits. Les Crutchfield, for example, was working as an engineer at Cal Tech when he first met Norman Macdonnell. His graduate studies included physical chemistry and mathematics which led him for a time into the mining industry as a foreman and explosives expert. 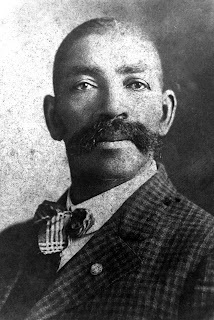 He eventually became an established radio script writer for such programs as Gunsmoke, The Man Called X, Suspense, Yours Truly, Johnny Dollar and Escape, among others. This is the kind of information you can find easily with or without the index. Ryan Ellett attempted to fill a void that was necessary for researchers of old-time radio programs to pull off the bookshelf with ease of access. He accomplished his goal and for that, my sincere appreciation. In 1986, editor Michael Stein introduced us to a new magazine that would preoccupy hundreds -- if not thousands -- of hours of pleasurable reading, saturating my love of nostalgic pop culture. 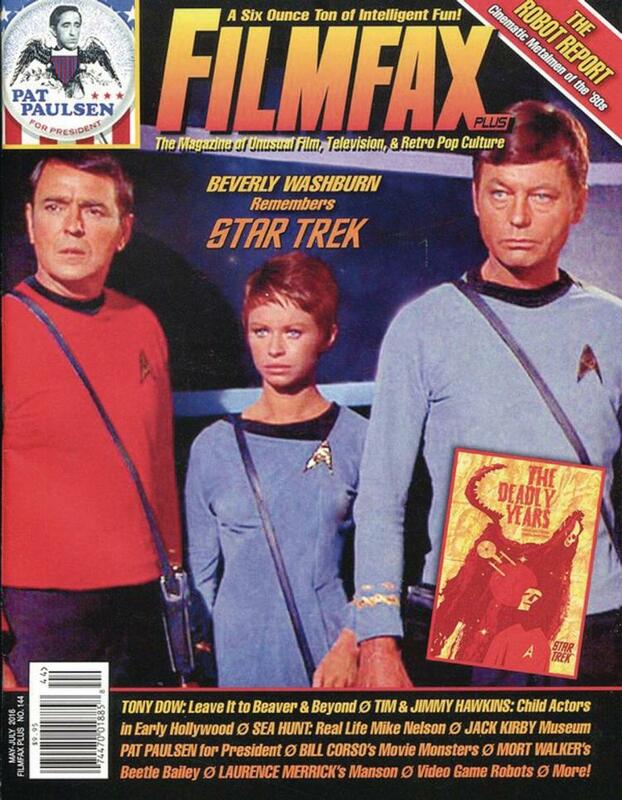 As Stein remarked in his editorial in the premiere issue, "Filmfax is not a 'nostalgia' magazine. Filmfax is a graphic time machine powered by your interest, and the memories and opinions o those who have contributed to our editorial body." If you love those old Universal Studios monster movies, 1950s film noir, The Three Stooges, Space Patrol, interviews with actors and directors like Roger Corman and Julie Adams, this is a great magazine. 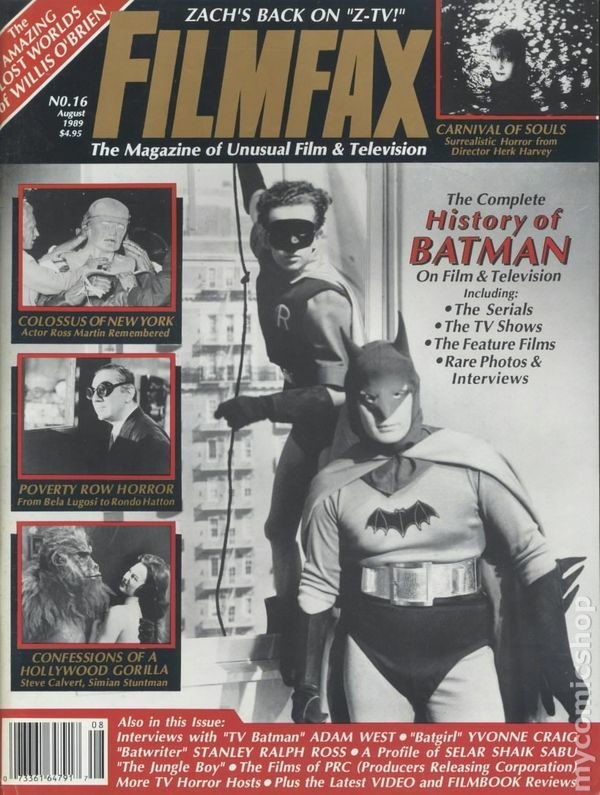 I first discovered Filmfax in 1992 when I bought the most recent issue from a vendor at a convention in Baltimore. There was the creature from This Island Earth plastered on the cover, larger than life. There was an article about comic book heroes adapted for the cliffhanger serials, an interview with character actor Turban Bey, an interview with Russell Johnson (Gilligan's Island), an interview with Mark Goddard from Lost in Space and Johnny Gringo, and other engrossing articles. Over time I enjoyed reading an interview with Fess Parker, the making of Disney's 20,000 Leagues Under the Sea, a biography of Hans Corned, a history of radio and television's Dragnet, an interview with Bill Scott (co-creator of Rocky and Bullwinkle), a making-of documentary of Beverly Garland's Decoy, and a rare interview with Margaret Hamilton (the Wicked Witch of the West from The Wizard of OZ). As a fan boy, the magazine was fantastic. For a generation that grew up with Famous Monsters of Filmland, I could understand how a bi-monthly magazine would become part of my childhood. I remember when one of my high school teachers took the magazine away from me because I was more fascinated in reading an article than classwork in front of me. (He would return the magazine to me a fe ways later but not before confessing that he himself read the magazine and loved those old black and white monster movies.) Over the years I sought out back issues when the pricing was affordable and I am proud to say I now have almost every issue in my collection. For collectors today: The first two issues sell for ransom prices and fluctuate based on market trends -- from $125 to $280. Issues #3 to 14 sell anywhere from $10 to $30. Issues #15 and up can sell anywhere from $3 (sale price) to $5. 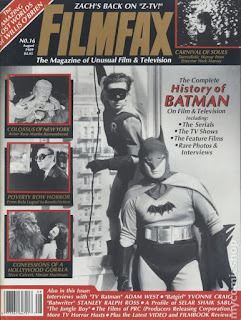 By issue #61 (June/July 1997), I started noticing an editorial change with two issues consisting of VHS/video reviews (possibly because the magazine was swamped with too many complementaries that was necessary to review else the complementaries stopped coming in) and too many articles about Bela Lugosi and Bettie Page to make me question renewing my subscription. Also, there were too many advertisements of products sold by the magazine (not a third-party paid advertiser) that I felt like I was paying for a mail order catalog. Factoid of the day: Most people do not decide overnight to stop subscribing to a magazine -- they simply let the subscription lapse and have no incentive to renew when the time comes around. That is exactly what I did. And for five years I stopped receiving the issues. 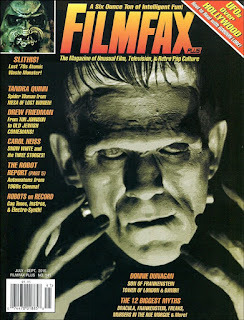 One afternoon at the Monster Bash convention I noticed a vendor liquidating overstock of Filmfax at a rock bottom price of $2 per issue. And there were issues I never received because I let my subscription lapse. After careful review I discovered there were multiple editors over the years and as anyone with an I.Q. above room temperature knows, a magazine is only as good as the editor. So, without skipping a heartbeat, I renewed my subscription. The magazine is no longer published six times a year. Now available as a quarterly magazine, you can subscribe at the price of $30 per calendar year or $55 for two years. 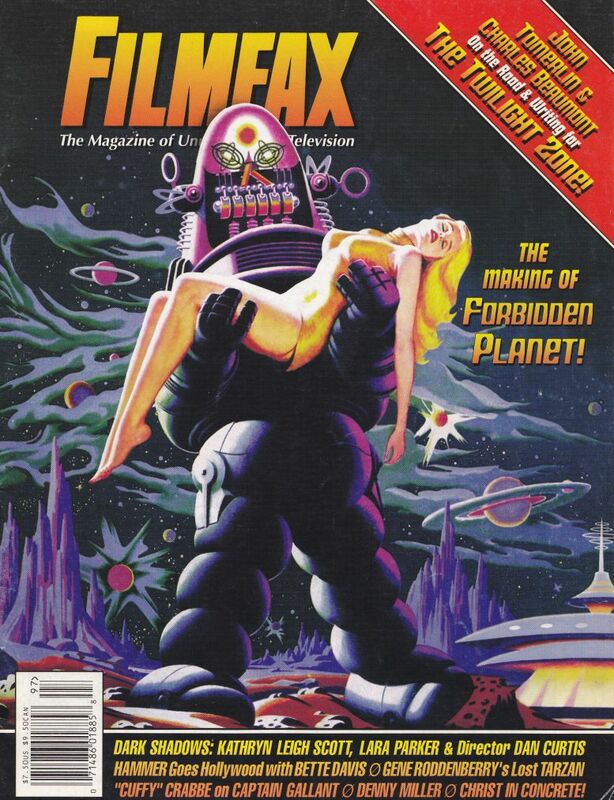 There is an official website that you can make payment and sign up for a subscription, www.filmfax.com, which has not been updated since issue #127, but do not let that throw you off. The company is reliable and your subscription is ensured. Collectors also have the option of purchasing back issues for $3 or $4 a piece using an order form in their latest issue. (And a sale where you can buy ten issues for $50 postpaid, 20 issues for $90, etc.) Do not ask me why it is cheaper to buy back issues than to subscribe to today's issues but it is what it is. Many of those back issues are gems. The sale price starts with issue #15 (which features an interview with Mel Blanc) and I would recommend you start there and work your way up. A bargain of a price for hundreds of hours of satisfying reading. 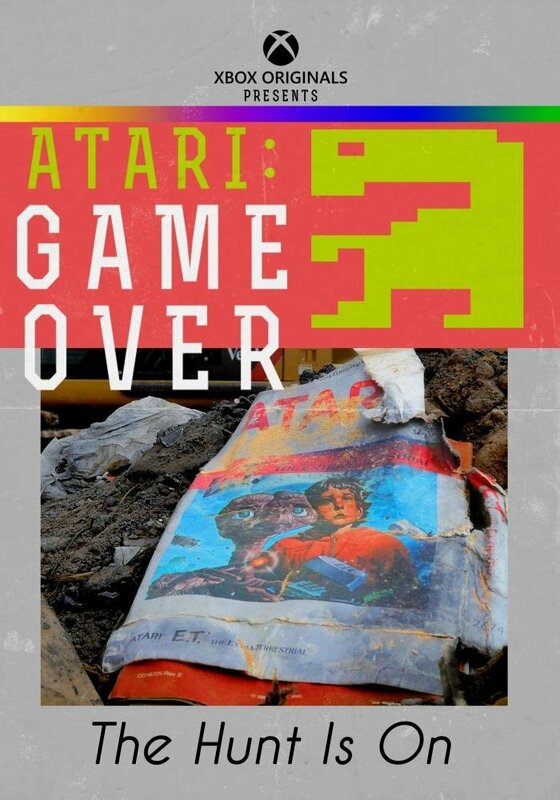 It has been years since I watched a documentary as entertaining as Atari: Game Over. Available on DVD and instant streaming on Netflix, this 2014 documentary chronicles the fall of the Atari Corporation and investigates one of the biggest mysteries of all time, dubbed "The Great Video Game Burial of 1983." 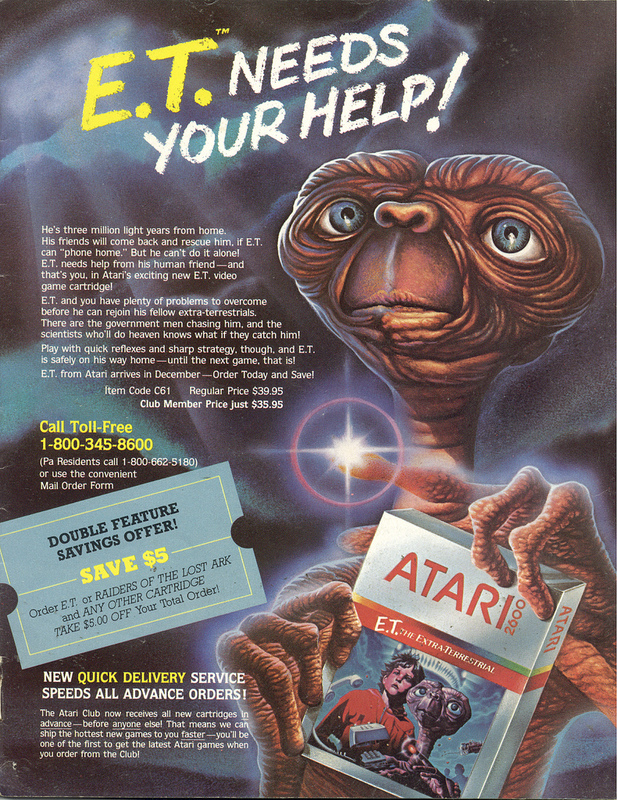 In the early 1980s, Atari supposedly buried nearly a million copies of the video game, E.T. 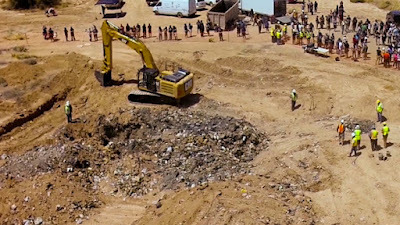 the Extra Terrestrial, considered one of the company's biggest commercial failures and often cited as one of the worst games ever released -- in a New Mexican desert landfill. The producer of this stand-alone documentary (which was meant to be the first of a series of documentaries about the video game industry) interviewed the financial wizard of the Atari Corporation, video game programmers who worked for the company, and chronicled his attempt to get approval from the small New Mexico town to dig and excavate what might be the secret burial ground for a major product dump. Never have I been so engrossed than the 66 minutes director Zak Penn put together. 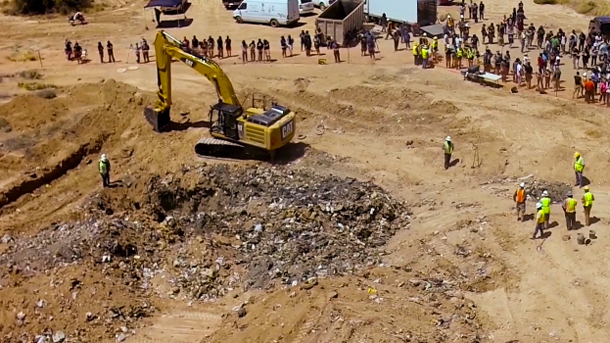 Over time, reports of this strange mass burial became an urban legend. Every company that established some form of pop culture has been subject to self-obsessed fanboys who create ridiculous stories that gives credence to second thought. 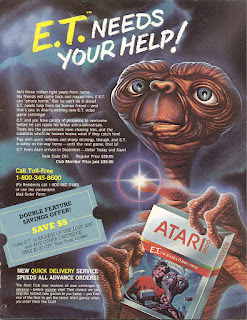 Yet, as the documentary unfolds, revealing the huge profits Atari made with their video game, Raiders of the Lost Ark, and the poor financial decisions to license E.T. ($22 million for licensing? Really? ), I understood where Penn was going with the story -- an academic explanation of why Atari would have made a business decision to dump excess product from a warehouse into the landfill a small mid-Western New Mexico town. Ludicrous and unbelievable? Not really. Last year my wife and I saw the other great video game documentary, The King of Kong: A Fistful of Quarters (2008), the saga of Steve Wiebe, a Redmond, Washington, dweeb who set a new high score for the video game, Donkey Kong, only to see his accomplishment challenged by the grand poobahs of the gaming establishment. It seemed he broke the record set by Billy Mitchell in 1982. Mitchell was not happy about being overthrown so he set about beating Wiebe's record. The rivalry between the two was delighted disbelief -- I marveled that such people existed -- and gladly allowed themselves to be filmed. I learned more about Donkey Kong than I knew beforehand and the director, Seth Gordon, presented a straight-forward documentary that did not mock these gentlemen, but rather presented us with a world of eccentrics. That was what brought me to watch Atari: Game Over. Jumping back and forth from the history of the Atari Corporation to the present-day attempt to get approval from the town council (who almost immediately had concerns of poison gas seeping into the air if such an excavation was conducted), interviewing the caretaker of the landfill, and finally getting past the red tape to find out if there was any truth to the rumor... all makes this documentary engrossing. And believe me, I was on the edge of my seat for those last ten minutes as the answer was about to be revealed. The rise and fall of the first generation video game industry is preserved on celluloid through this killer documentary. Fact or fiction? I will not spoil the ending but needless to say, if the premise of this documentary or the urban legend intrigues you, take time to seek out this documentary. You will not be disappointed.